Are you seeking a unique setting for your special event? The Morris Arboretum's grounds and facilities will put your event in a class of its own, away from the rush of modern life, against a backdrop of gorgeous gardens. A variety of indoor and outdoor settings may be rented with direct access to the rest of the gardens for you and your guests to wander and enjoy with plenty of free on-site parking. 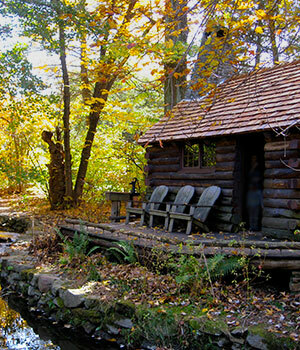 Enjoy peaceful, natural surroundings for a memorable event. Rentals are available for Corporate events, social events and parties. If you want to impress your guests in a setting like none other, take your party Out on a Limb! Designed by Metcalfe Architecture & Design, Out on a Limb is fully accessible and impressively lit at night. 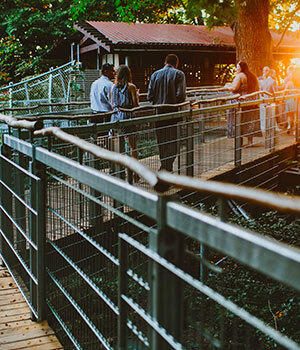 Host an intimate sit-down dinner party or a cocktail reception from up in the treetops. The Widener Visitor Center serves as the base for your event. The adjacent tented area, with optional side flaps for inclement weather, can accommodate up to 175 guests for a sit-down dinner (tented area not available November - March). Tables and chairs are included. The tent is outfitted with ceiling fans and portable heaters. Several interior rooms off the tent accommodate essential party features, including: a bar, dessert station, photo booth, etc. Wheelchair accessible restrooms are available indoors and out. Built in 1908 beside a creek, the Log Cabin was used by the Morrises to entertain friends and now you can entertain a party of six in this historic structure. It remains an idyllic spot to enjoy the woodland plants in this area and is a perfect place for an intimate dinner party, perhaps a romantic wedding proposal, or to celebrate a milestone anniversary or birthday dinner with your closest friends. The Upper Gallery is located on the main floor of the Widener Visitor Center and is a great location for birthdays, showers, or other events. The floors are carpeted, lights are dimmable, and the walls are lined with nature-inspired exhibits. The original barn door slides to create a separation from the Arboretum’s gift shop. The Upper Gallery accommodates 80 people audience style and 65 at round tables. The Classroom is located on the lower level of the Widener Visitor Center and works well for smaller gatherings—up to 22 people. The room includes a large chalkboard and screen. The Mercer tile floor, stucco walls, exposed wood beams and French doors create a cozy, rustic ambience. 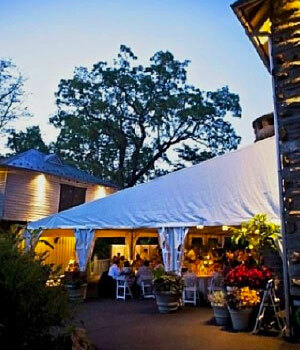 For daytime events during the months of April through October, the side tent is a great outdoor option. From this hillside vantage point behind the Widener Visitor Center, many of the Arboretum’s trees and other plantings serve as the backdrop. This area is adjacent to the Compton Café and screened for privacy. The Side Tent is not air conditioned but cooled by ceiling fans. The Side Tent accommodates 50 people audience style and 40 at round tables.